A sure sign of summer coming to an end is the loss of daylight hours and cooler temperatures. For both the competitive rider and the club rider, your season is approaching its final phases. Since you have trained hard all spring and summer, you are probably still carrying some good form. Before you get into the, “I need to start getting ready for 2017” mindset, take advantage of your current fitness. Keep your motivation high by setting new goals, taking on new challenges and working on your weaknesses. A change in routine will give your mind and body a much needed rest. A good start to maximizing your late summer fitness is using it to achieve new goals. Maybe there is a hill you always ride and can use your good form to set a new record for yourself. Or, this might be the perfect time to log that century ride that you were not able to do during the season. Another target goal would be to use this time to get to your goal weight. While this may seem like an odd time of year to cut weight, having dietary restrictions in place while preparing for the 2017 season is not ideal. Without the demands of the high intensity training and a high calorie intake, the end of the road season is the perfect time to ride and cut calories because you don’t have to worry about being topped-off with fuel and feeling good. One huge motivational factor for me is thinking about what races or rides I want to peak for the following year. Keeping these events in the back of my mind helps me stay motivated even though the goal is a long way away. Your goal setting process should include long range goals, like placing top three at a road race in June, but also short term goals that will help you accomplish that goal. Learn the specific demands of your event, then train to meet those demands. This will give you short term targets, like raising your FTP to a certain number, or improving your ability to climb for an extended period. These near term goals are easier to focus on and will keep your motivation high. Use your end of season fitness and try something new with your bike. Maybe there is a local time trial you have always wanted to do, or a late season gravel grinder. Now is the time to incorporate fun new challenges into your cycling or even get out and do a group ride that just didn’t fit in your training schedule previously. You can ride with friends that are mad at you for not riding with them during the season. Social rides and non-structured rides keep you on the bike without the pressure of following a set plan. You could also give cyclocross a try. 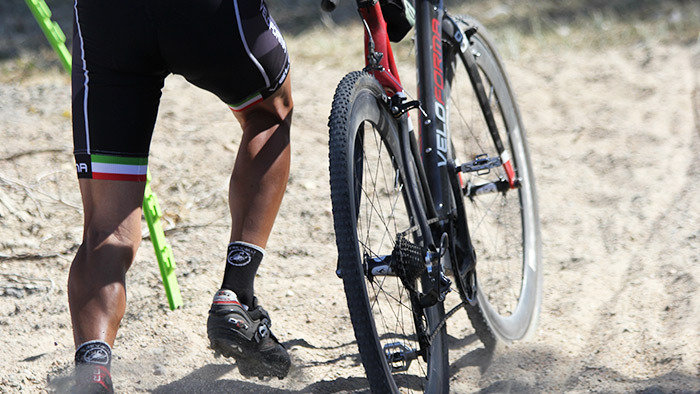 You don’t have to be a hard-core ‘cross rider to do an event or a practice session. Who knows, maybe your end-of-season form will bring a better than expected result? Perhaps there is a Gran Fondo you want to tackle? Doing something new is a good break from your standard routine and keeps you moving in the right direction. Post season is the perfect time for working on the components of your cycling that need improvement. During the season, your plan might not allow for fine tuning your pedal stroke, working on your sprint, or working on your climbing form. Without the pressure of preparing for races or events, you can now pay attention to your pedal stroke. I find that at the end of a racing season, some riders cadence has diminished. Use this less rigidly structured time to revisit the fundamental and work on bringing your RPMs back up. Without the focus being on intervals or efforts on hills, it is also a great time to work on your climbing form. Taking time to concentrate on areas that need improvement will put you on good footing as you move into the next training season. With your season winding down, there is no need to concentrate on training sessions, such as intervals, sprint work, etc. By setting some goals and making changes to your normal training pattern, you might be able to create enough of a spark to rekindle a little excitement in your training before you settle into full-on off season preparation for 2017. Taking a break from the demands of following a structured plan is good to do at this time of year. The key is to not lose your motivation. Keep riding, enjoy the freedom of not having a plan loom over your head. The end of the road season is a time to be enjoyed, not dreaded.